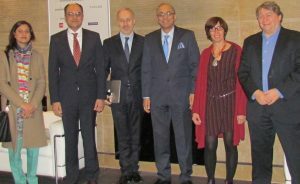 Paris, 29th March, 2017: A 21-Member Delegation of French Business Confederation (MEDEF) headed by Thierry Pflimin, Chairman of France-Pakistan Business Council of MEDEF and President of Total Global Services is travelling to Pakistan on a 3-day visit to explore business, trade and investment opportunities from 4-6 April, 2017. 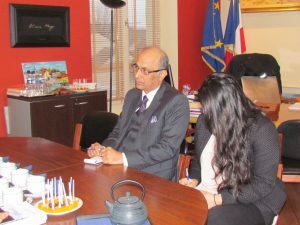 The Ambassador of Pakistan to France Moin ul Haque who gave a detailed pre-visit briefing to the delegation earlier this week in Paris termed the visit as historic. 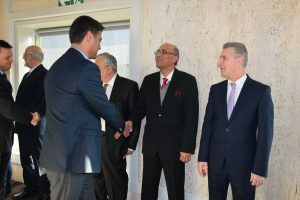 He said that the visit would provide members of the French delegation a first-hand experience of attractive investment opportunities and facilitation offered by Pakistan to the foreign investors. 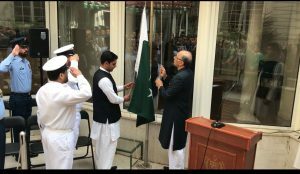 The Ambassador briefed them about the economic turnaround of Pakistan, which has been termed as one of the world’s top emerging economies. He expressed the hope that the visit of the MEDEF delegation to Pakistan will give a renewed impetus to business, trade and investment ties between Pakistan and France. 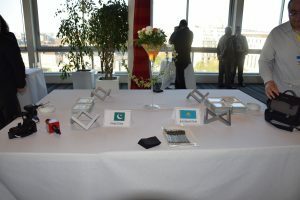 The MEDEF visit is jointly organized by the Embassy of Pakistan in Paris and the Embassy of France in Pakistan. 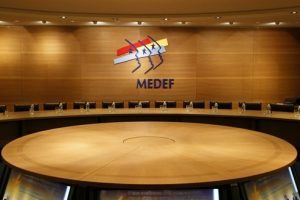 It consists of senior representatives of renowned French companies including Airbus, Credit Agricole, Engie, JC Decaux, Suez, Thales and Total. 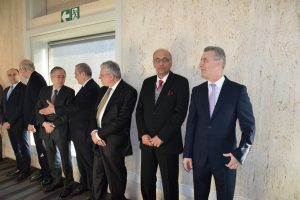 The delegation will visit the cities of Islamabad and Karachi and will hold meetings with Ministers and senior officials and as well as private and public sector companies, Business Council of Pakistan and Pakistan France Business Alliance. MEDEF is composed of 85 sectoral federations and 155 local federations bringing together on a single platform more than 750,000 small, medium and large French enterprises. 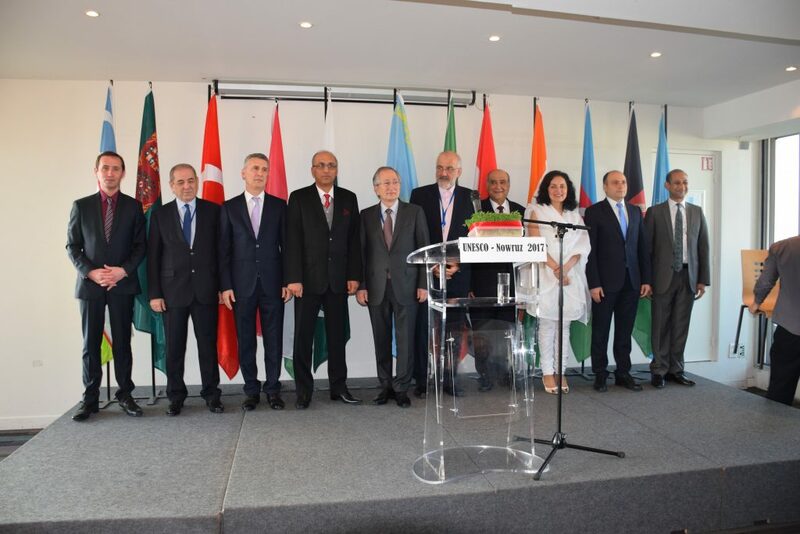 Paris, 27th March, 2017: An impressive and colourful ceremony to celebrate International Nowrouz Festival was held at UNESCO Headquarters in Paris today. 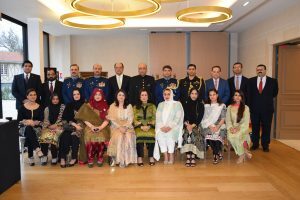 The event was co-hosted by Pakistan alongwith other regional countries from South Asia and Central Asia. 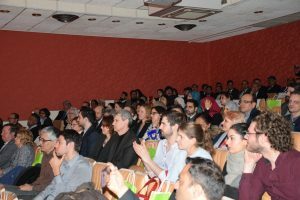 Regional folk performance and cuisines reflecting the rich social and cultural diversity of the Nowrouz sharing countries was presented during the event. Nowrouz has been inscribed on the UNESCO Representative List of Intangible Cultural Heritage of Humanity and its celebrations promote values of reconciliation, good neighborliness, cultural diversity and friendship among peoples and different communities. Paris 28th March, 2017. 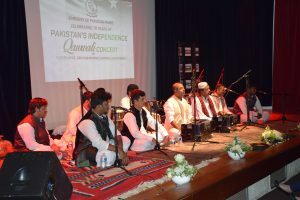 Pakistani Qawwals Ayaz Farid and Abu Mohammad captivated the French audience with their performance in a Qawwali concert organized by the Embassy of Pakistan to France as part of its Public Diplomacy Initiative ‘celebrating Pakistan’ and as well as to mark seventy years of the Independence of Pakistan. 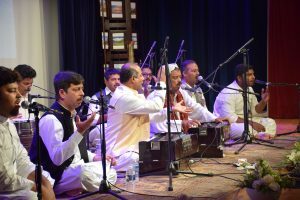 The Qawwali concert held in Paris last night was attended by high ranking French government officials, member of French civil society, diplomats, members of international organizations, notables of Pakistani community and media persons in large number. 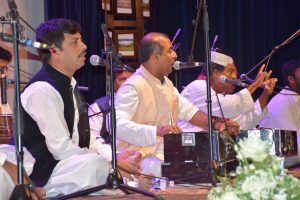 Ayaz Farid and Abu Mohammad who come from an illustrious family of sufi musicians presented a soulful renditions of sufi music and won memorable appreciation form a distinguished parisien gathering. 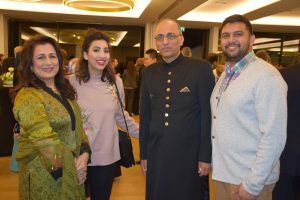 Speaking at the event, Ambassador of Pakistan to France Moin ul Haque said that the holding of a Sufi Music event in Paris, the cultural hub of Europe, aimed to introduce Pakistan’s rich and authentic musical traditions to France and to spread the message of peace and harmony. 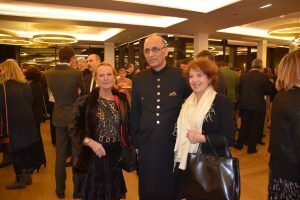 The Ambassador added that under ‘Celebrating Pakistan’ initiative, the Embassy has plans to organize a number of events throughout the year in France to show case Pakistan’s beautiful landscapes, culture heritage, art and crafts and the achievements of the Pakistan’s in the fields of education, business, sports, film-making and fashion. Paris 24th March, 2017. 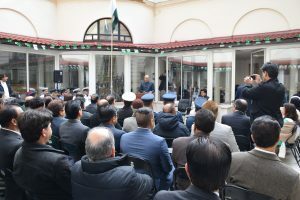 Embassy of Pakistan to France hosted a grand reception in Paris on 23rd March to mark the Pakistan Day. Mr. Francois Pupponi, the French Parliamentarian and President of France-Pakistan Friendship Group in the French National Assembly, Mr. Xavier Lemoine Mayor of Montfermeil city, high level French dignitaries, members of the Diplomatic Corps, intellectuals, researchers, scholars, prominent Pakistani expatriates and members of French and Pakistani media attended the reception in large number. 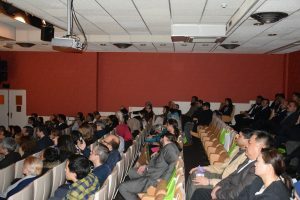 Live Pakistani national songs alongwith impactful documentaries on Pakistan played during the reception were greatly appreciated by the participants. 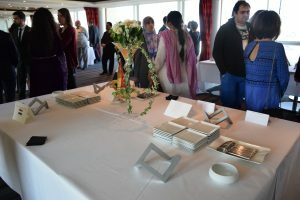 A special corner adorned with traditional Pakistan handicrafts was also a source of attraction for the guests. 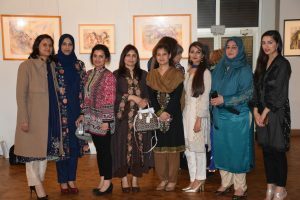 The guests were treated with traditional and signature Pakistani dishes. 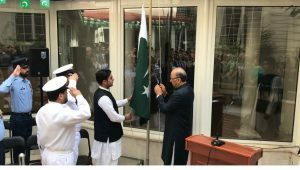 23rd March, 2017: A Flag Hoisting ceremony was held at the Embassy of Pakistan in France, Paris today to Commemorate Pakistan day. 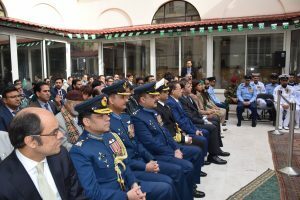 The ceremony was attended amongst others by the Pakistani community, officers of the missions and their families and media persons in large number. 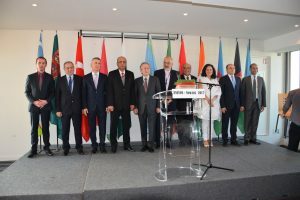 Addressing the ceremony, the Ambassador of Pakistan to France Moin ul Haque paid rich tributes to Father of the Nation and other national leaders of the Pakistan Movement, who with their untiring efforts and immense sacrifices finally carved a separate homeland for the Muslims of India on 14th August, 1947. This year we are also celebrating 70 years of our independence he added. He also briefed the participants about the steps taken by the government to address the issues of terrorism and extremism, eliminate power shortages, upgrade the road and railway network and education and health infrastructure ushering a new era of development and prosperity. 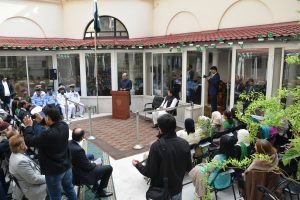 The massages of the President and Prime Minister of Pakistan issued on the occasion were also read. Paris 4th January, 2017. 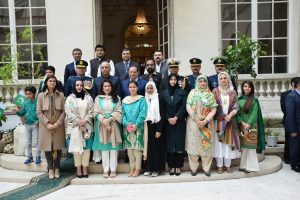 Bilateral cooperation between the higher education sectors of France and Pakistan especially for the Master and Doctorate degree programs in the engineering, management and research fields would help provide high quality human resources to Pakistan’s growing and expanding industrial and manufacturing sectors. 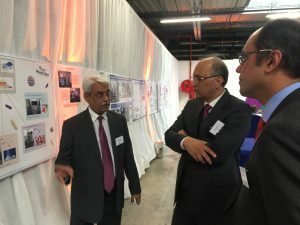 This was stated by the Ambassador of Pakistan to France Moin ul Haque while talking to Mr. Philippe Jamet, President of Institute Mines-Telecom (IMT) during his visit to IMT’s headquarters in Paris, today. 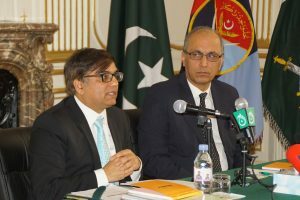 The Ambassador said that Pakistan is on a positive growth trajectory since last three years with enhanced investments by foreign and local investors. 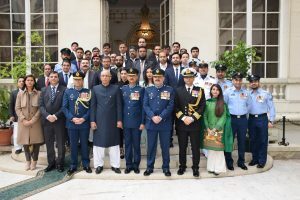 Pakistan would seek to launch industrial-based research projects with France in order to meet the requirements of the growing industrial and communication infrastructure in the country. 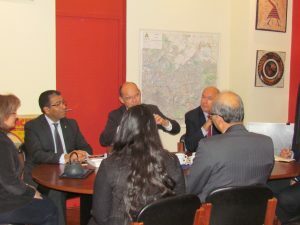 Ambassador briefed them about government’s focus and increased budgetary allocation for the higher education and sought IMT’s collaboration to set up campuses by the French top Universities in Pakistan. Ambassador invited IMT’s delegation to visit Pakistan to hold meetings with Higher Education Commission and management of top universities of Pakistan and research institutions of Pakistan. President, Mr. Jamet said the engineering and management schools under IMT umbrella are known for their innovative tools for producing leaders in engineering and digital transition, while innovation providing state of the art research laboratories to the scientists to pursue their research work. The institute also provides higher education in the fields of energy, environment, future technologies, economic, management and cross disciplinary education like health and wellbeing and smart and sustainable cities. 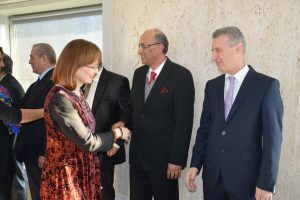 Ms. Frédérique Vincent, Executive Vice President, International Affairs and Mr. Christian Roux, Executive Vice President for Research and Innovation were also present during the meeting. 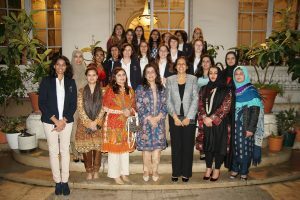 More than 600 Pakistani students and pursuing their Master, PHD and post doctorate degrees in various higher education institutions of France. IMT is an umbrella supervisory setup of the Ministry of Economy of France which have over ten top engineering and business schools under its fold with over 14000 students across France. Paris 27.01.2017. 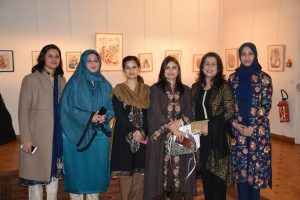 The Government has given a renewed mandate to Board of Governors of Overseas Pakistanis foundation by bringing new reforms and taking practical steps aimed at overall welfare of the community through their active involvement and participation. 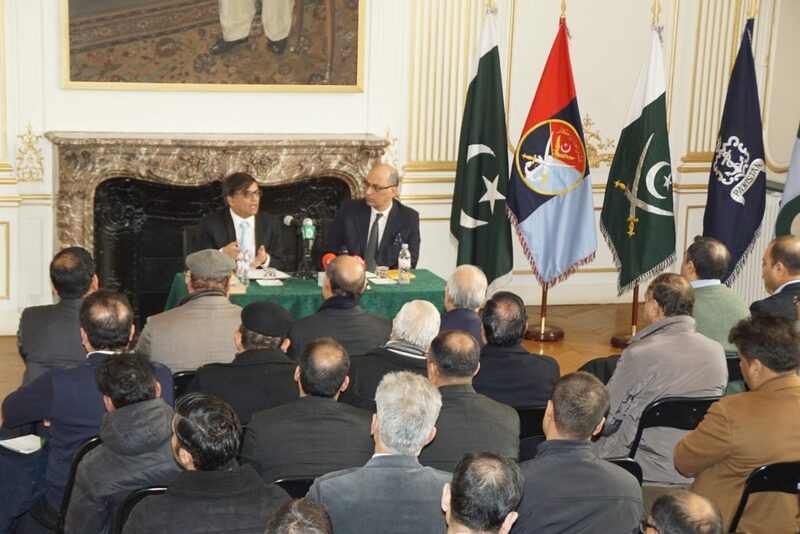 This stated by Barrister Amjad Malik, the Manchester based Chairman of Board of governors of Overseas Pakistani foundation (OPF) while taking to the Pakistani Community of Paris and Paris based Pakistani Media in embassy of Pakistan during his day long visit to Paris today. 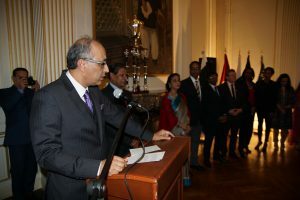 Ambassador of Pakistan to France Moin ul Haque was also present on the occasion. Barrister Malik briefed the community in detail about the newly constituted OPF Board of Governors, its mandate and future projects. He said that OPF has been reactivated to provide fast and effective services to the Oversees Pakistanis. A new state of the art online Complaints Management System has been introduced, facilitation desks at all International Airports have been established and financial aid to the destitute families have been increased. 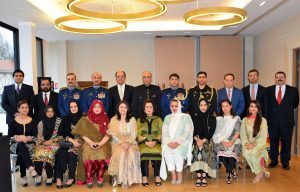 He appreciating the important role played by the Pakistani community for promoting the positive image of Pakistan and their contributions and socio economic development of in improving the economy of the country by way of sending substantial remittances to Pakistan. During the meeting, the community members provided useful suggestions which would help government to further improve the services and take new initiatives to be announced at oversees Pakistanis Convention to be held late this year. 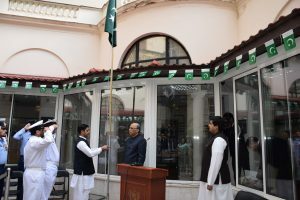 The Barrister Amjad Malik visited the councilor section of the Embassy and expressed his satisfaction and appreciated automatic photographic capturing machine, electronic data capturing and refreshment point provided by the Embassy to the visiting Pakistani Community. Paris, 25th January, 2017. 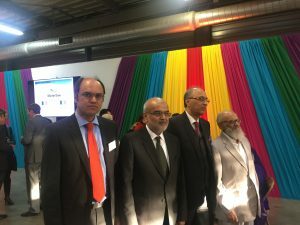 The Pakistani community due to its entrepreneurship skills, peace loving nature and hardworking qualities is playing an active and constructive role in the development, progress and prosperity of Montfermeil in particular and France in general. 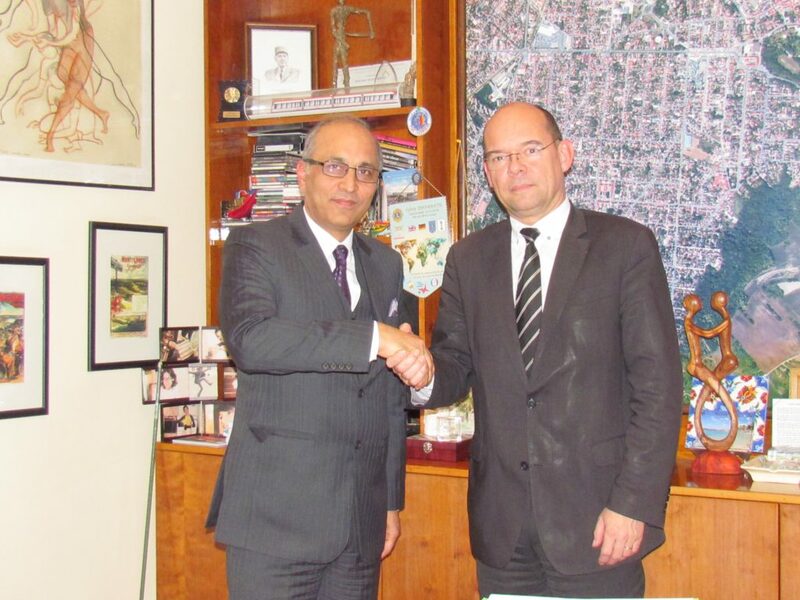 This was stated by the Ambassador of Pakistan to France Mr. Moin ul Haq during his meeting with Mr. Xavier Lemoine, the Mayor of the city of Montfermeil, near Paris, today. 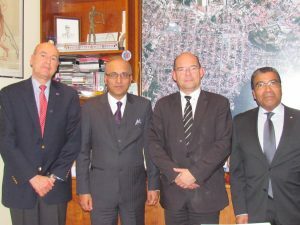 The Ambassador apprised the Mayor that over 100,000 strong Pakistan community which largely lives in and around Paris is mostly engaged in trade, construction, services and hospitality sectors. They are law-abiding citizens and contributing their due share in the progress and prosperity of France as a peaceful community. 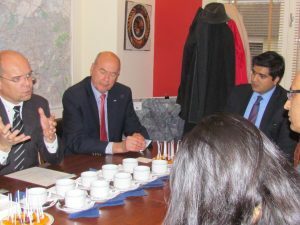 He thanked the Mayor for his support to the Pakistani community. 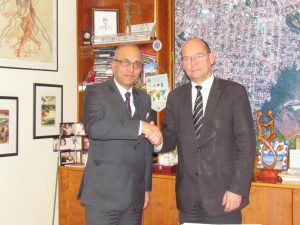 The Ambassador said that Pakistan greatly values its friendly and close relations with France. Both the countries are desirous of expanding and strengthening their bilateral relations especially in the fields of trade, investment, defence, education and culture. 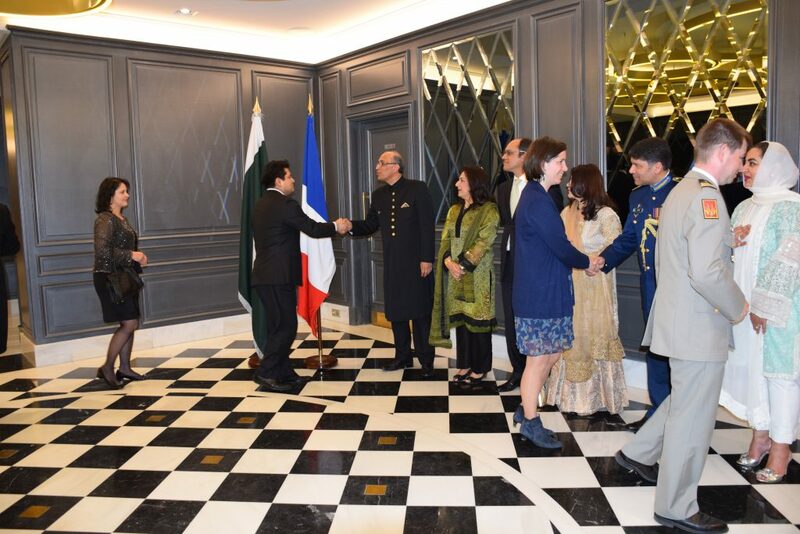 Ambassador also apprised the Mayor of various initiatives conceived by the Embassy to introduce Pakistan’s rich cultural and folk traditions, archaeological and historical treasures and scenic beauty to the people of France. 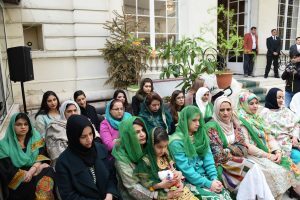 The Mayor appreciated the positive role played by Pakistani community in his city and also extended his full support to the Embassy for organizing cultural and heritage related events of Pakistan in Montfermiel. Paris, 31st January, 2017. 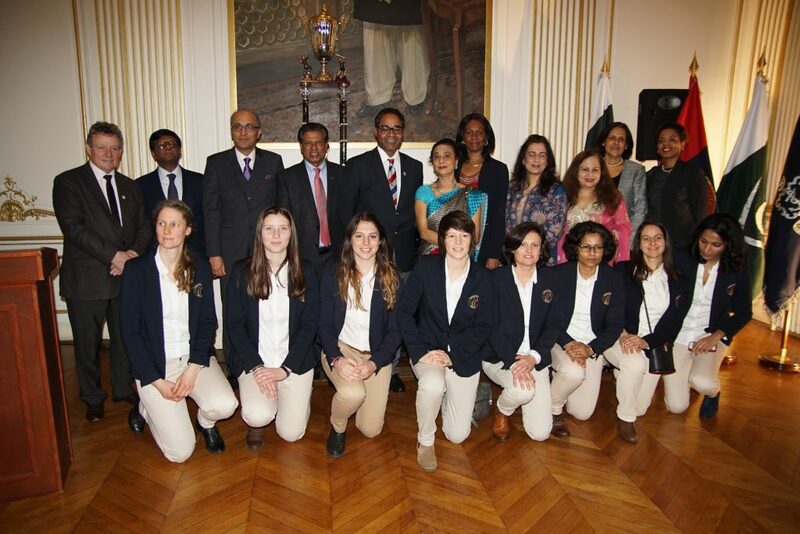 Pakistan will continue to support the promotion of the game of cricket in France. 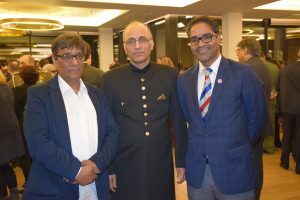 This was stated by the Ambassador of Pakistan to France Mr. Moin ul Haque during a reception hosted at the Embassy for the France National Men and Women Cricket Teams and winner team of Jinnah Champions Trophy in Paris, today. 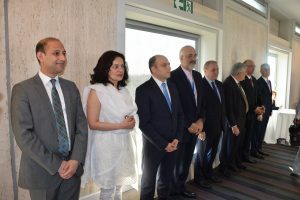 The reception which was jointly organized by the Embassy of Pakistan and Embassy of Sri Lanka was attended by the members of French Men and Women National Cricket Teams, Mayor of the city of Druze, President France Cricket and Chief Selector France Cricket. 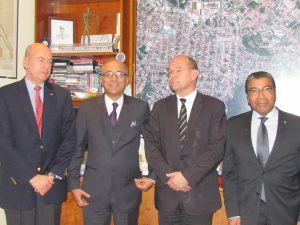 Ambassadors from the cricket playing nations, senior officials from the French Ministry of Sports and media. 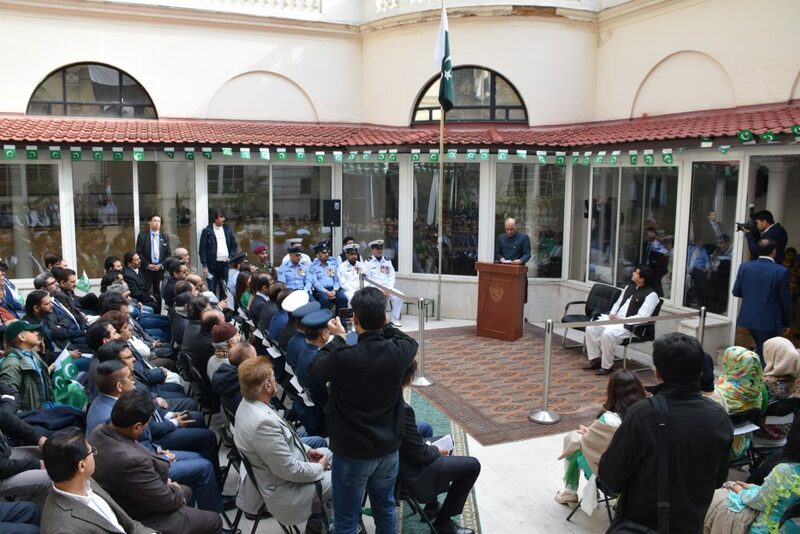 Speaking on the occasion, the Ambassador said that successful holding of Pakistan sponsored two editions of Jinnah Champions Trophy in 2015 and 2016, has helped in promoting the game of the Cricket in France which is becoming increasingly popular amongst the local youth. 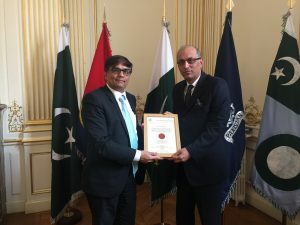 Pakistan assured cricket France for continued support and sponsoring of Jinnah Trophy in France. 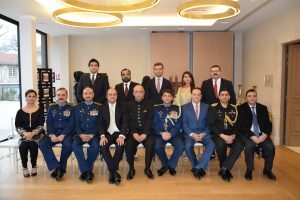 Jinnah Champions Trophy being sponsored by Pakistan Embassy for the last two years is currently the most prestigious cricket tournament in the cricket circuit of France. 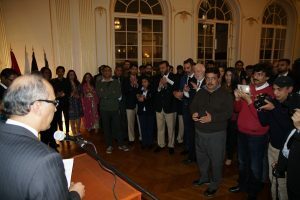 The Ambassador of Pakistan to France Mr. Moin ul Haque addressing at a reception hosted at the Embassy for the France National Men and Women Cricket Teams and winner team of Jinnah Champions Trophy in Paris, today. Ambassador of Sri Lanka and Ambassadors of Ambassadors from the cricket playing nations, senior officials from the French Ministry of Sports and media were also present 31st January, 2017. 16th March, 2017. President of France Francois Hollande inaugurated the pharmaceutical facility of the leading Pakistani pharmaceutical company Martin Dow in the town of Meymac, Corrèze, located in the South West of France, today. 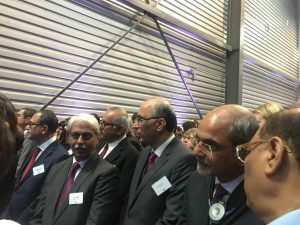 The inauguration ceremony was also attended by the Ambassador of Pakistan to France Moin ul Haque, Mr. Phillippe Brugere, Mayor of Meymac, Mr. Pascal Coste, President of the County Council and Madam Nathalie Delcourserc Julliard Vice President of the Regionls Council, French government officials and notables of the area. 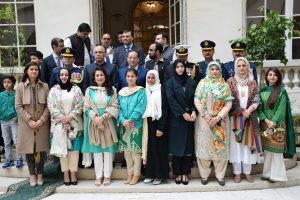 President Hollande said that this investment is a symbol of Pakistan-France friendship which will further grow in years to come. He said that acquisition of former American Bristol-Myers Squibb’s pharmaceutical plant by a Pakistani pharmaceutical company was a positive step in consolidating investment ties between France and Pakistan and as well for creating new job opportunities in the region. President Hollande visited various part of the factory and was given a detail briefing by Mr. Jawed Akhai, Chairman. 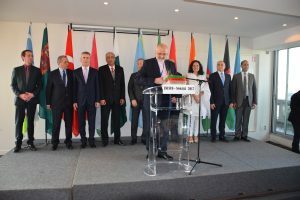 Later speaking to media, the Ambassador of Pakistan to France Moin ul Haque welcoming the investment by Martin Dow said that it was a reflection of the growing strength and confidence of Pakistan’s private sector to successfully expand its outreach in the developed world. This would also have a salutary effect in attracting French investment to Pakistan. The said plant was setup by the Américan Company Bristol-Myers Squibb (AMS) in 1990. It was later taken over by the Algerian Company Salem Labs in 2010. After the closure of operations by Salem Labs in 2015, it was acquired by the Pakistan group Martin Dow. 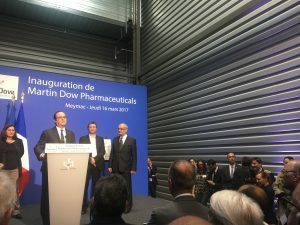 Founded in 1995, Martin Dow is one of the largest Pakistani owned pharmaceutical companies in Pakistan.